It’s not just us who get excited by planning bespoke birthday parties. Over in the States, gorgeous parties are just as popular as they are here. 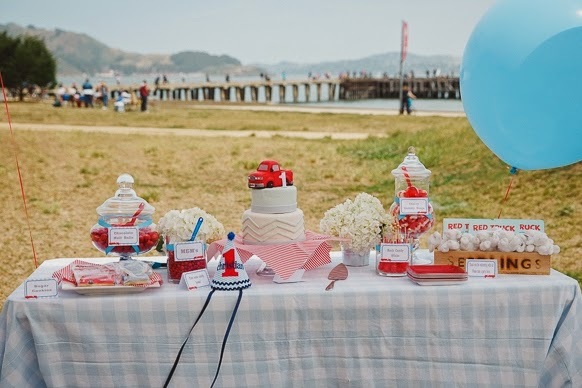 We spoke to Samantha Spector, Event Planner and Designer from Milk and Honey party planning in the US, about how they recently themed a first birthday party. 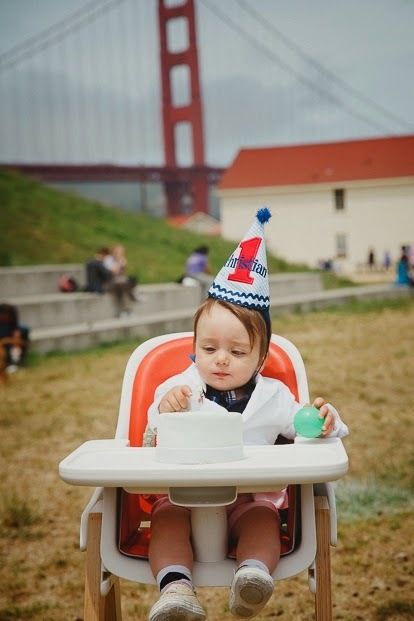 To say we’re inspired is an understatement..
“Maybe it’s the whimsical themes and color schemes, the exciting milestone or the adorable guests of honor, but when it comes to planning first birthday parties, nothing really compares. Christian’s first birthday was no exception. The party took place at one of San Francisco’s most gorgeous outdoor venues, Crissy Field. And in terms of the city’s unpredictable weather patterns, it turned out to be a lucky day! The Golden Gate Bridge was a perfect backdrop, the reddish color of the bridge went perfectly with our red, light blue, light grey and white color scheme. The theme of the day was red trucks and we incorporated a chevron motif into the décor as well. Iconic. Could you ask for a more suitable backdrop? The dessert bar was the main focal point of the party, featuring a gorgeous chevron two-tier birthday cake with a big red truck on top. Sugar cookies in the form of red fire trucks and blue and grey number ones decorated the dessert bar and picnic tables, and finally, an assortment of red candy topped it off. The light blue checkered linens were a perfect twist on the classic picnic design. We had red plates, light blue utensils and food labels that went with the theme. Cupcake toppers completed the cakes and even the focaccia sandwiches we served, too. We stuck with picnic friendly foods that were filling enough for a lunchtime party; sandwiches, salads, skewers and a large cheese and cracker spread. Decorations included custom made birthday banners, tissue pinwheels, oversized round balloons and white hydrangeas in tiny buckets. Since the guests included many kids in a range of ages, we needed to have entertainment to suit everyone. Enzo, one of San Francisco’s favorite kids’ entertainers, came and played an array of instruments to accompany his songs. The kids played on grey chevron picnic blankets while he performed and played with an assortment of toys including a tent that looked like a red truck, a light blue inflatable pool filled with balls and plastic truck toys. The goodie bags (or favours as well call them) included “Red Truck” board books and white lamb rattles for the tiniest guests. Judging from the exhausted kids at the end of the party (baby Christian climbed into another kid’s buggy to fall asleep), it was a success! Not living State side? Don’t worry, we can help you out if you’ve been inspired.